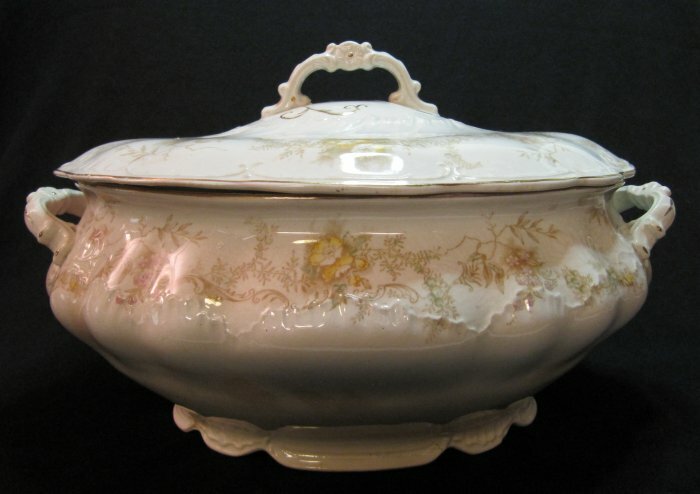 > Tureen measures a generous 13 inches across and 8.5 inches tall, including the 3 inch high lid. > According to Geoffrey Godden's "Encyclopaedia of British Pottery and Porcelain Marks," Brownfields Guild Pottery Society Ltd. and Brownfields Pottery Ltd. were in business from 1891-1900. The firm was located in Cobridge, and was acquired by Staffordshire Potteries. CONDITION: Piece is in excellent condition for its age, clean with no cracks, breaks or chips on the tureen or the lid, including the handles and lid top. Has normal crackling and dispersed age-related brown discoloration that is primarily on the inside and bottom of the tureen. International customers: If shipping cost to your location is not shown, please contact seller for a shipping quote and invoice for your purchase.